The Story of John W. Dobson and His Formula Growth Fund. The first-ever look at one of Canada’s greatest growth investors and champions of entrepreneurship. In 1960, Montreal stock broker John Dobson launched an informal investment club with a close group of friends and associates, including future prime minister John Turner. His Formula Growth Fund would go on to become one of North America’s most successful investment funds, consistently outperforming the Dow Jones Industrial Average and attracting the likes of legendary investor Sir John Templeton.With a foreword by the Right Honourable David Johnston, “Up and to the Right” tells the story behind John Dobson’s investment success as well as his many contributions to entrepreneurial education. Craig Toomey provides valuable insight into his unconventional but disciplined investment approach, his uncanny ability to predict winning stocks, and his unwavering faith in the market despite its many ups and downs. 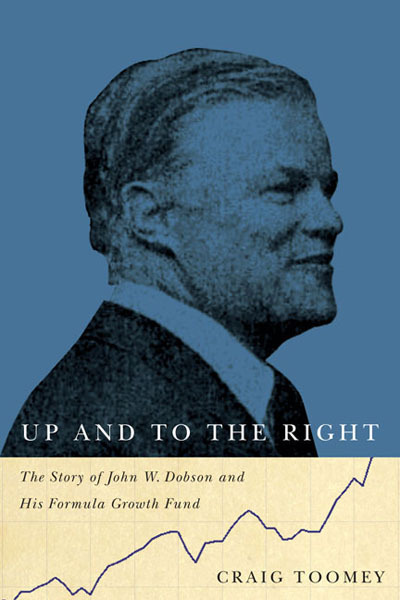 Based on interviews with Dobson as well as with dozens of members of his extensive network of friends, colleagues, and investment professionals, “Up and to the Right” is a fascinating story about a great Canadian who believed deeply in self-reliance and free enterprise as well as the value of friendship, pursuing one’s passions, and working for the greater good.